I learned that with collage on canvas I like the security of the grid, even if it’s a loose grid. I learned that paper can substitute for paint to change a color or a value. It’s hard to describe the difference between working small and going larger with collage. 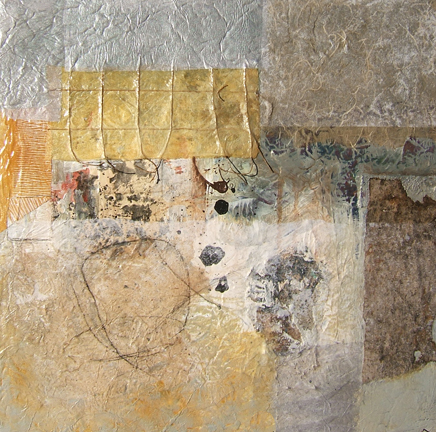 The small collages in sizes up to 11×14 inches are much more intimate and can be completed in a relatively short time. Decisions are usually instantaneous. Not always, but that’s my general experience. With a larger canvas, I tend to take more time and step back, or sit and contemplate the piece from across the room. 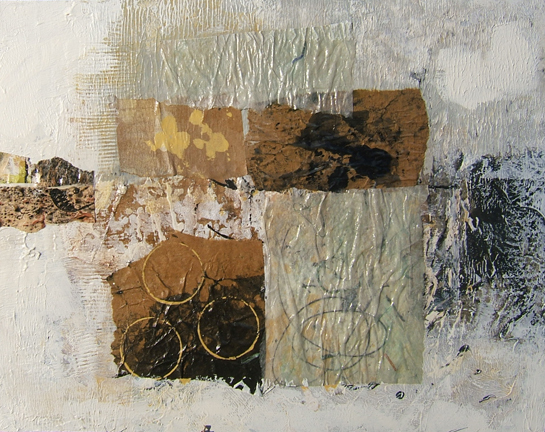 In that aspect, it’s no different from my other large paintings that did not incorporate collage. The glossy areas are from the afternoon sun when these were shot. When they are finished the surfaces will be uniformly glazed, probably in a satin finish. I’m pleased with the wrinkles of some of the papers, which works well with the deep paint texture. Both pieces are quite wonderful, Martha. I see you made some of the grid paper and tinted it gold just like I did. Isn’t that a wonderful technique? Very useful in small doses. I love looking at your work. These are starting to look fabulous. I understand the power of the grid, although I rarely use it myself. But I recognize its value and appeal. You use it really well. Thanks, Bren! I’m sure I will, because I’ve enjoyed collage so much since I finally became comfortable with it. It’s always made sense to go ahead and push it in the direction of paint and canvas.